Biscotto don’t have to be a dessert that is served at the end of a meal. The biscotti in this collection can be a meal in itself or a side dish served at mealtime. 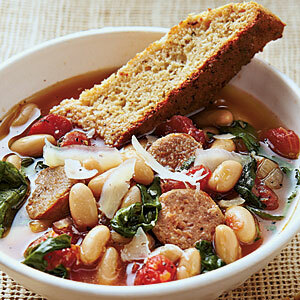 Try these recipes and see for yourself how delicious they can be for breakfast, lunch or dinner. If you are on the run some of these are definitely better that a doughnut when having your morning coffee. OR, if you have more time, enjoy these along with soup or salad. Corn meal ones to go with your chili, or garlic parmesan to go with you spaghetti. Try them with cheese spreads, or bacon flavor with your eggs. The even make a great appetizer when paired with complementary cream cheese spreads of dips. Biscotti as MOST know, is a crunchy twice-baked, cookie-like bar, that you dip into your cappuccino or sweet wine. But biscotti can be flavored with ingredients other than chocolate and nuts. They do not have to be sweet. To make these in to a nifty alternative to crackers or bread, you can add cheese, herbs, spices, and even chopped sun-dried tomatoes or olive. 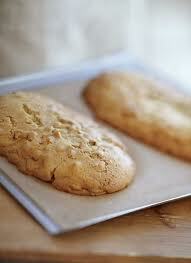 It is the second baking that really establishes the character of biscotti, “its intense crunch”. This does make biscotti a little more complicated than cookies, but the dough is easy enough and the options are countless. The combinations are limitless and that is what interests me most. I’ve made biscotti with saffron, cardamom, chilies and the aforementioned sun-dried tomatoes and olives with great success. The spicy combinations of cheese and peppers are among my favorites. Regardless of flavor, the procedure remains the same: you form the dough into a log and cook it until it’s firm to the touch. After cooling, you slice it and bake it a second time, flipping them after 10 or 15 minutes so that both sides are nicely toasted. The only real difference is how you server them. With a nice glass of wine, some fruit and cheese, these are divine. MORE TO COME CHECK BACK SOON!